Davis Instruments is a private company that manufactures and develops exclusive devices for weather, nautical, and automotive use. Davis Instruments takes pride in offering innovative, high-quality products at fair prices. 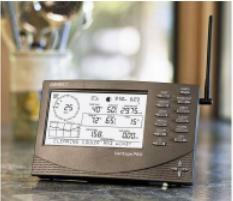 Additionally, the Davis Instruments catalog includes cabled or professional wireless weather stations for weather coverage, home use, educational use, and more. Pick from a wide range of stations to fulfill your requirements. Enjoy products that have a great reputation for their quality and value across the world - you are well covered with Davis Instruments.